Cherry Espresso Bar opened towards the end of 2016, although it’s been going since 2013, operating inside Stein’s Deli on Magazine Street. This branch, in the Uptown district, west of the Lower Garden District, is a bit of a trek, but well worth the effort. Occupying the ground floor of a lovely, sunny, south-facing building near the river, it’s very much a neighbourhood spot, but with multiple options on espresso and pour-over, plus full breakfast and lunch menus, served until three o’clock. In many ways, I picked a poor time to visit. I arrived shortly before Cherry Espresso opened another branch in the Lower Garden District, midway between Uptown and the French Quarter, at the same time closing its original location. Cherry Espresso has also started roasting (as Cherry Coffee Roasters), with plans to move to its own coffee on espresso, but retaining a guest roaster on the second grinder. 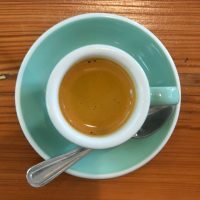 For now, however, Portland’s Roseline provides the house espresso, while there is a rotating weekly guest single-origin on the second grinder, which was from Wisconsin’s Ruby Coffee Roasters during my visit. There are also two single-origins from Roseline available through the Chemex while Cherry’s own coffee is on the bulk-brewer. On the corner of Laurel/Upperline Streets, not far from the river, the Cherry Espresso Bar occupies the ground floor of a century-old, two-storey brick-built building with a sheltered outside seating area, complete with secure bicycle parking. Two tables shelter here under orange awnings, while a door midway down the right-hand wall saves you a walk around the main entrance on Laurel Street. Inside, there’s a simple layout, representing what I’ve come to think of as “typical American coffee shop” (rather than “third-wave hipster coffee shop”). Occupying a rectangle, with the short side at the front, the seating is followed by the counter at the back on the right, with the restrooms on the left, the kitchen behind them. Perhaps twice as deep as it is wide, and almost as tall, this makes for a roomy interior, plus with windows on three of the four sides, it’s bright too. A tall arch occupies maybe half the width of the front wall, a single, glass door in the centre, while there are two tall, narrow windows on either side towards the back. At the front, another arch on the left has a disused door, while opposite that, a rectangular glass door/window leads to the outside seating. There’s a clear space directly in front to the door, leading all the way to the counter at the back. The bulk of the seating is on the left, with two rows of five two-person tables. Nine of these are square, while the one immediately next to the door is, for a change, round. There’s an additional pair of (square) two-person tables in the left-hand corner, followed by a six-person bar running along the left-hand wall. The seating on the right is much less regimented. A two-person green leather sofa, flanked by a pair of comfy chairs, occupies the corner to the right of the door, along with a second round, two-person table. There’s a single-seater round table against the right-hand wall, then comes a six-seater communal table parallel to the takeaway station. Finally, there’s the counter, an L-shaped affair, the bottom facing forwards, where you’ll find the espresso machine and which is also where you collect your coffee (yes, the plague of counter-service strikes again). To order, make your way down the left-hand side of counter, where, once you’re past the temptation of the cakes, you’ll find the till at the far end, the coffee choices on the end wall. Opposite the counter, against the left-hand wall, there’s a conveniently-located set of retail shelves. I passed up on the house-blend, selecting instead the single-origin guest, a washed Burundi from Ruby Coffee Roasters, a Wisconsin-based roaster which I’ve seen popping up all over the states. In this case, its presence is due to the owner, Lauren, who originally hails from the Mid-west. My barista, Andrew, recommended the Burundi as an espresso. This was an excellent coffee, full of flavour, with very much a front/roof of the mouth feel. There was some acidity, but no sharpness. I paired this with a slice of the olive oil and rosemary polenta cake, a lovely, rich cake with that typical polenta texture. I returned to order a pour-over through the Chemex. Again I followed the recommendations of Andrew (who, like the coffee he recommended, is from Portland, Oregon), who steered me to the Kenyan, a rich, fruity coffee. Served in mug, I would have preferred it in a carafe so that I could play with temperature. Nevertheless, it kept on giving subtle changes in flavour all the way to the bottom of the mug, an excellent finale to my visit. This entry was posted in Breakfast, Cafe/Roaster, Cafes, Cake, Coffee Terraces, Laptop Friendly, Lunch, New Orleans, Retailers and tagged include by Brian Williams. Bookmark the permalink.